7)- Shutter speed: do not go below 1/60 (slow shutter speed) with hand held camera; to freeze motion the starting point is 1/500 (fast shutter) + above. Night photography = high iso, or use a tripod (best!) or strobe (flash). Times Square at midnight: try camera mounted on a tripod, exposure 4-30 seconds, f-stop f16. Beach (extreme light) expose at 1/1000 or above. You get the idea where to begin! 8)– Photography is all about light, measuring it, using ISO, shutter speed, aperture proportionately for balance time/motion (shutter speed); depth of field (f-stop); available light (ISO). Play with the three: try low IS0 (100); low shutter speed (1/60); middle-ground aperture (5.6). What happens when you bump up the ISO to 400, 1600, 3200, 6400; and/or use a faster shutter speed (1/250); or increase the f-stop to f11 or higher? 10) Enjoy the experimentation; let reason and inspiration -- left + right brain guide you to spark your creativity. As part of the session, post your art on SPY's Facebook page -- we want to see your work! Portaits made with iPhones surpass the number of images made with point and shoots. iPhone images can be posted to social media sites right away -- immediate gratification -- and are more readily available than digital files from any other camera. Needless to mention: a new generation of smartphones is being produced with camera sensors as large as 41MP (Nokia 808). Small but powerful cameras can get many photography jobs done not only efficiently but also in style. I have always enjoyed photographing people: the iPhone is making it easier for me as a photographer to ingratiate myself -- gaining access to any stranger, anywhere, anytime. Because of the low light the iPhone capture lends a softness to skin tones at low shutter speeds (no flash); the resultant images and digital noise can be very artistic. One way to change it up is to photograph yourself -- after all, you are a willing and available subject. I like to experiment during night photography -- when I photograph myself while wielding an LED flashlight and waving it in the direction of the camera, poised on a tripod, with a 20mm lens stopped down at F16 for a 30-second exposure. 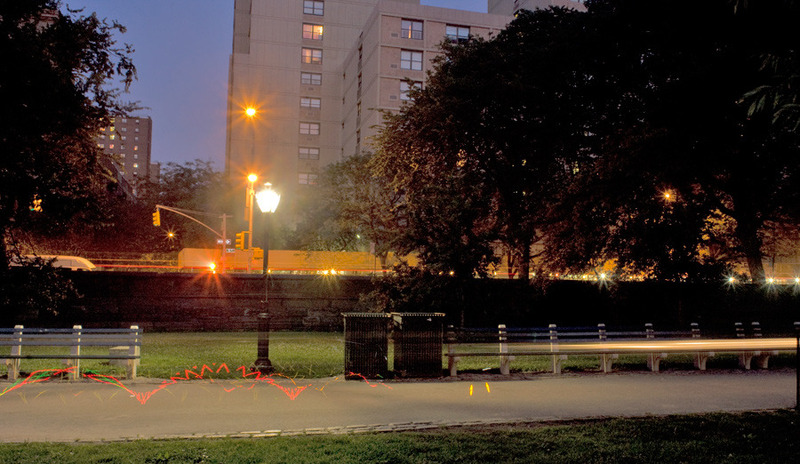 Try it out: The exercise becomes one in self-portraiture at night and in light painting. Making pictures remains a series of experiments, both analog and digital, day and night. Keeping a daily photo diary is very easy with iPhoneography: think of the process of taking pictures with an iPhone as making visual notes to yourself. In response to the quote “No art exists that isn’t autobiographical” (from Quaderni Azzurri, or Blue Notebooks, by Aldo Rossi, an Italian architect and poet of the visible), I encourage you to create your own visual notebooks. Go on day and evening photo safaris to photograph people, places, and things with any type of digital camera, including iPhones, with an eye on spontaneity. What kinds of photographs, art, or statements do we make when we surrender to chance? Reviewing your visual notebooks made in the moment may surprise you. New York City is an island, which is all too easily forgotten as we walk north and south and east and west on a relatively small expanse of land. Manhattan is known as one of the most legendary metropolises in the world and participants of NYC Spark Your Creativity Photo Safari & Workshop experience the city waterfront and beyond the 34 square miles that make up Manhattan to go, in short, island hopping. With dozens of islands to choose from in New York waters, Governor’s Island, Roosevelt Island, City Island, Randall & Ward’s island, Riker’s Island, Coney Island, Ellis & Liberty Island, Staten Island, Broad Channel (Jamaica Bay), Breezy Point (Rockaways peninsula), to name a few, they exist for photographic exploration. With tiny cameras -- small but powerful 'point and shoots' of all generations run the photographic gamut as does iphoneography in the cornu copiae of image making, still promising to inform, entertain, enlighten, uplift, transform and now share instantaneously unlimited and uncontrollable image provenance and destination. The keywords remain: small but powerful. An iPhone 4 produces an image that is approximately 2mb while the iPhone 4S file weighs in at roughly 5mb -- files that are plenty big for both online and print editorial. The iPhone is more than a plastic camera -- it provides a Cornu Copiae of options (apps and more) in a compact package that allows a photographer to produce images in, seemingly, an act of spontaneous combustion -- in part magic , in part Surrealist dream -- from the creator's mind to digital file. The results are 'mind pix' -- photographs -- products or byproducts of camera presets and by extension image makers' random thoughts, passing emotions, uncensored dreams, with the freedom of the unbridled five senses conspiring to create a plethora, or cornu copiae, of digital images that transpose and translate vision alomost supernaturally. A Photo Safari Diary: May 13 (Mother's Day) A photo safari to the Conservatory Garden, 105 & 5th Ave, NYC, provides a look at an exquisite French-style, Italianate, and English garden, rolled up in one, in Central Park. The space is a designated quiet zone -- perfect for contemplation, meditation, and exercises in creativity, such as, shallow and deep depth of field exercises to test your hand and understanding of the sensitive relationship and resultant artistic possibilities that aperture, shutter speed, and ISO yield. Think highlights and shadows -- how to capture them -- to best render your vision. May 5 (Cinqo de Mayo): A Photo Safari to Harlem, USA is as always an adventure in neighbohood discovery where a community of old timers, workers, artists, hipsters, professionals, and activists is continually in flux against a backdrop of colorful and historical brownstones. Harlem welcomes tourists from around the globe but my little group of 10 togs (student photographers) who come from NYC and beyond (as far flung places as Sydney, Australia) behave more like inquisitive travelers on a photojournalistic expedition for which the skills in learning the craft of photography and seeing ('Sapere Vedere' -- knowing how to see) are practiced throughout the day. While photo safaris satisfy a desire to go beyond the comfort zone, remember to stay engaged in practical photo exercises which encourage mastery of the camera and creativity. During photo safaris, you shoot practicing the rule of thirds, capturing negative space, and ultimately discovering novel ways to create compositional balance and harmony in your pictures. Focus on 2-4 new technical and aesthetic tips and tricks for shooting images of people, places, and things each time you go out... .